Crucial, being a Micron subsidiary, has access to NAND from its parent company’s fabs. It rolls this advantage over to you, pricing drives such as the company’s new MX200 lower than the competition: $470 for the 1TB version is a bargain in a top-end drive. The kicker is, Crucial makes even less expensive, albeit slower SSDs such as the BX100 that we also hope to review. It’s nice that Crucial provides realistic Terabytes Written (TBW) ratings—that is, how many terabytes can be written before the drive theoretically wears out: 320TBW for the $470/1TB MX200, 160TBW for the $250/500GB model, and 80TBW for the $140/250GB version. You might be put off because those ratings are backed by a mere three-year warranty, but you shouldn’t. As SSD warranties are of the whichever-comes-first variety, there’s actual little difference in terms of total coverage from Samsung’s competing 1TB 850 EVO with a 5-year warranty, but an unrealistic and rather low 180TBW rating. The varying approaches to coverage can be leveraged to your advantage if you know your usage scenario. Buy the EVO and be covered for 10GB a day for five years, or buy the Crucial and be covered for 30GB a day for three years. The MX200 employs the same Marvell 889189 controller found in the M550 SSD Crucial released last year, but pairs it with Micron’s new 16nm MLC NAND. That’s squeezin’ cells pretty close together, which allows more in less space, but reduces their longevity. Crucial now provides Storage Executive, a browser-based utility that lets you see S.MA.R.T information, download debug info (for tech support), as well as perform firmware upgrades and reset the PSID (Physical Security ID). The latter doesn’t zero cells as a secure erase will; it simply creates a new encryption key so that old data on the drive is unreadable. Yes, the MX200 supports encryption. The MX200 is not the fastest SSD we’ve tested at any one thing, but it’s pretty darn good in all phases, and there’s no drop-off in performance with the lower capacities. As a matter of fact, the smaller 250GB and 500GB capacities proved slightly faster. On my testbed, CrystalDiskMark rated the three MX200s at about 495MBps to 500MBps reading, and 480MBps to 490MBps writing 4MB sequential files. The drop with smaller 512KB files was only about 30MBps in each direction. Random reads and writes were also quite good, at 30KBps/80KBps on single 4KB files and over 300KBps with 4KB files at a queue depth of 32. It really doesn’t get much better with a single drive on the SATA bus. You’ll need to switch to a PCIe solution or combine drives in RAID 0 to go any faster. You can’t argue with the MX200’s price. It’s the most affordable top-shelf SSD out there. However, if you’re more about capacity than performance, consider the $400 1TB Crucial BX100 or even Sandisk’s 960GB Ultra II, which is available at a steep discount. 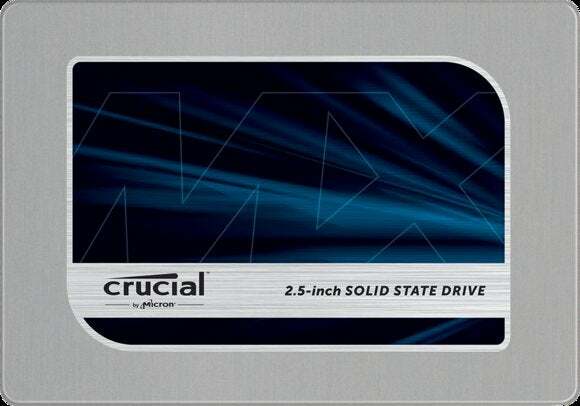 Note: The MX200 will also be available in other form factors, such as mSATA and M.2 (SATA), but Crucial was unable to provide any at the time of this writing.